2016-06-12 Figured out how the DS3231 RTC alarm works: the RTC alarm sets an internal alarm flag and makes the RTC SQW pin low, however the SQW pin stays low until the alarm is cleared in software. 2016-04-25 Measured power consumption of the NodeMCU board. The consumption in deep-sleep is a rather disappointing 3.3 mA (expected something < 1 mA). I might need to go to a different ESP8266 platform than the NodeMCU. 2016-04-19 Connected a LiFePO4 battery and made a scan of the trip from RevSpace to Gouda, one point every 20 seconds. Using this kind of battery to power the ESP8266 directly seems to work fine! 2016-03-26 I've been thinking about using the WiFiManager component, this component presents you with a web page to configure stuff, like the name/password of the AP to connect to the internet. It also allows you to configure extra properties. I could put the URL of the upload server in these extra properties (and just HTTP GET the rest of the settings from the server). 2016-03-25 I got submission of wifi scan results to google working, Mozilla appears to use a compatible format (i.e. the google JSON format with some extensions). 2016-03-17 Can't really get the wake-up using the DS3231 to work, the interrupt pin appears to be active all the time, keeping the ESP in reset. I think I'll just use the ESP built-in wake-up mechanism. Forget about trying to access the web using unsecured access points. Open access points are highly likely to be run with a captive portal, which are non-trivial to bypass automatically. The idea of this project is to create a simple and low-cost WiFi location tracker. 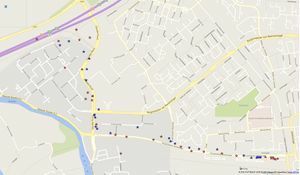 It tracks location by periodically scanning for WiFi station ids, storing those in internal memory and using one of the various location services (google, mozilla, openwlanmap, etc.) to determine a geographical location from this. monitor movement of wild animals for research purposes, like bats or stone martens. the tracker is in deep-sleep most of the time, keeping only a low-power real-time-clock running. every once in a while (say once a day) it wakes up, takes a reading of all WiFi stations in range and their signal strength. It stores these in internal memory. if the tracker wakes up to find an WiFi station that it can use to access the internet, it tries to upload all previous readings to a server. the server resolves the uploaded data into geographical locations using a service like Google or the Mozilla Location Service. I'm basing this on an Wemos D1 mini. This board is basically an ESP8266-module on a break-out board with an USB-serial converter and a proper 3.3V power supply. 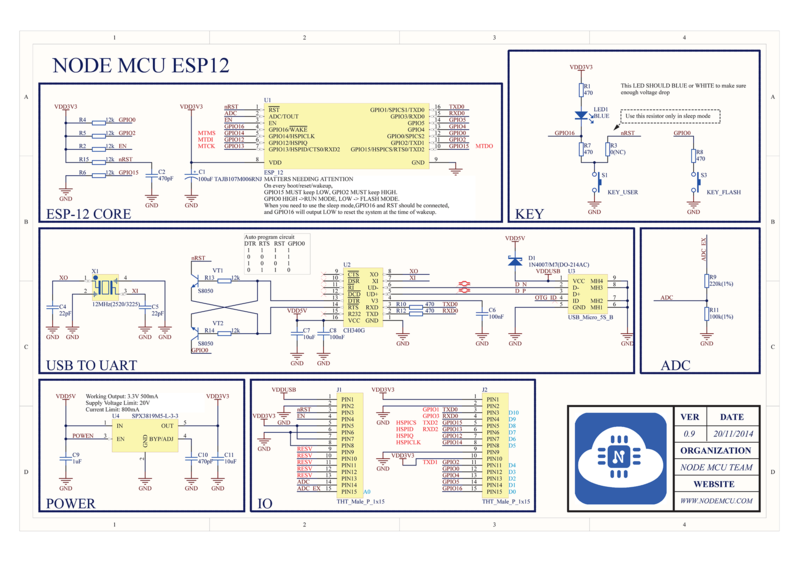 The ESP8266 is a WiFi-capable microcontroller, capable of running at 80 MHz, most versions commonly sold have 4 MB of flash onboard with enough spare flash sectors to hold a file system. Pin D0 (GPIO16/WAKEn) is connected to RST to support wake-up-by-reset with the ESP internal deep sleep mode. To keep time, I'm using a ZS-042 clock module, containing a Maxim DS3231 RTC chip (datasheet). This module is attached to the NodeMCU through the I2C-bus on pins D1 (GPIO5/SCL) and D2 (GPIO4/SDA). I removed the power LED on board the ZS-042 module, since one of my reasons for using an RTC is to save current by keeping the electronics mostly in low-power sleep mode and the power LED wastes current unnecessarily. Pin D5 (GPIO14) is used to distinguish between run mode and debug mode during reset/wake-up. When this pin is pulled low (e.g. by a wire to GND), the tracker goes into debug mode. If this pin is left floating, an internal pull-up makes it high and the tracker goes into run mode. I'm powering the ESP8266 directly off a single cell LiFePO4 battery. In particular I'm using a "14500" battery, which has the same dimensions as a common "AA"/"penlite" battery. A single cell of this type outputs about 3.2-3.4V, which is a good match for the ESP8266 voltage requirement of 3.3V. Possibly the high power consumption during sleep mode can be fixed like discussed here. Connect pin D0 (GPIO16/WAKEn) to the RST pin and use the ESP.deepSleep(x) command. This puts the ESP into a low-power deep sleep mode for x microseconds. After these x microseconds, pin D0 pulses low causing a reset of the entire ESP8266. I think this can keep the ESP in sleep mode for a maximum time of about 1h11m35s (2**32 microseconds). Put the ESP to sleep using the ESP.deepSleep(0) command and use an external RTC to generate a reset pulse on a specific wake-up time. The DS3231 RTC can generate an alarm signal on an arbitrary date and time, but it outputs a level-like signal (low if the alarm has triggered). You cannot tie this signal to the ESP reset pin because it would keep the ESP in reset indefinitely. The trick is to connect a capacitor (about 1 microfarad) between the RTC alarm output and the ESP reset input. The capacitor turns the low-going edge into a negative pulse, causing only a short reset pulse after which the ESP can clear the alarm in the RTC. Makuna RTC (by "Makuna" - Michael Miller) which can be installed into the Arduino environment by going to menu Sketch/Include Library/Manage libraries..., then searching for 'Makuna rtc' and installing it. The software can run in one of two modes, run mode and debug mode. If pin D5 is pulled low during start-up, the software goes into debug mode In debug mode, it runs a simple command interpreter, type 'help' at 115200 bps to get a list of supported commands. If pin D5 is left unconnected, the software goes into run mode. In run mode, the device scans APs, saves the result to a time-stamped file in flash memory and goes back to sleep as soon as possible to save power. TODO: check out https://wiki.bitlair.nl/Pages/Projects/KPN_Hotspots_Autologin and see if I can run it inside an ESP. I'm thinking of a kind of whitelist/blacklist mechanism to select an AP for uploading data. The plan is to score each scanned AP against this list and then select the one with the highest score, excluding APs which have a negative score. The first match in the list determines the score, so the list is ordered from most specific to least specific. The score is based on network name and encryption type. try any open network that is unknown to us. where an entry with an empty password represents an open network. append the results of the scan to file, the file name is based on the current date. The device id is the ESP MAC address. Times are in UTC. The Google Location Service seems to be interested in the channel too (not sure why), we could also log this. For the settings file, I'm thinking of a simple ini/properties file structure, with KEY=VALUE pairs in it, with empty lines and lines starting with "#" being ignored. see also this WiFi positioning page on Wikipedia. The MAC address of the ESP8266 should be unique and can be used to identify a specific tracker. Communication between the tracker and the server is always initiated by the tracker. The protocol is REST (HTTP) and the format is JSON. I'm thinking of writing this in Java, with the use of Jackson 2.0 (JSON), Jersey 2.0 (REST) and Jetty libraries. I've measured the current drawn by an NodeMCU board from the battery under different circumstances. while scanning for APs: not sure, it draws a short high peak, my multi-meter registered a maximum value of about 150 mA. The NodeMCU deep sleep mode current is a very disappointing, I was expecting a lot lower. Just this current will drain a 700 mAh battery in about a week. 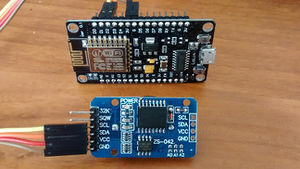 Disconnecting the RTC gives a current of 3.3 mA, so most of the deep sleep current appears to be consumed somewhere on the nodemcu board. This board seems to draw about 0.16 mA in deep sleep mode. Draining a 700 mAh battery would take about 180 days, quite acceptable. 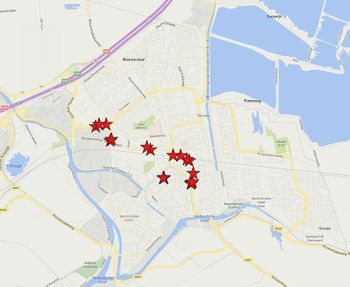 Shown here is a plot of locations from an AP scan done every 10 seconds, while traveling by car from RevSpace (The Hague area) to the train station of Gouda. 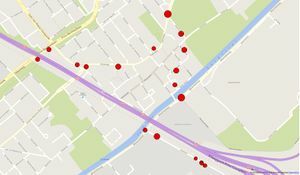 Locations have been resolved using both the Google geo-location API (blue) and the Mozilla Location Service (red). 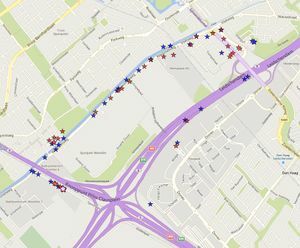 In total, Google was able to resolve 220 locations, Mozilla was able to resolve 204 locations. You can see clearly that both Google and Mozilla give a lot of fixes in urban areas. We probably drove with a speed of around 50 km/h in the urban areas (and stopping for some traffic lights) and around 130 km/h on the highway. Noticeable is a huge gap on the A12 highway north of the town of Zevenhuizen, for both Google and Mozilla. This page was last modified on 2 September 2018, at 09:51.